An early Christmas present from the ACR? The American College of Rheumatology (ACR) announced this week new criteria for diagnosis of Rheumatoid Arthritis. Yesterday, we discussed some of the possible impetus for the change. Today, we’ll look more specifically at the changes. What is different about the new criteria? 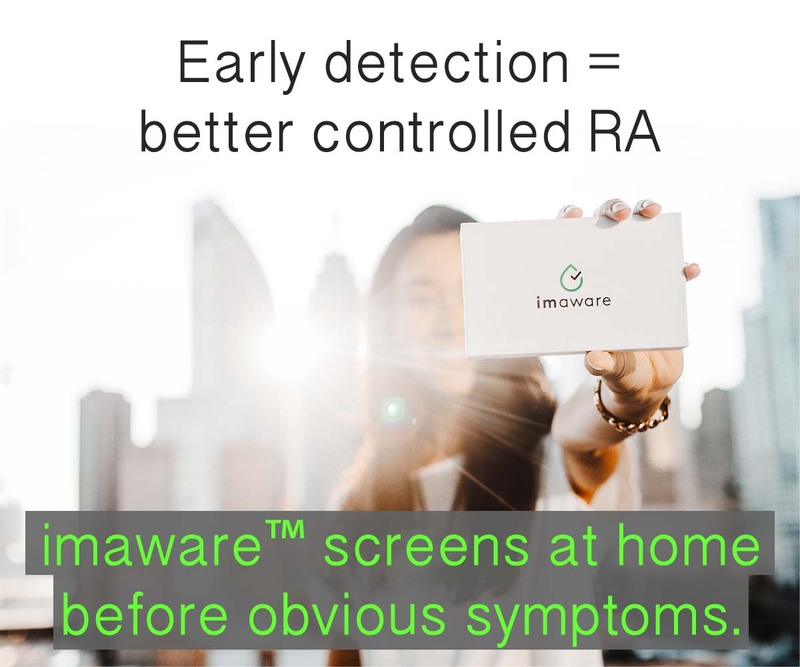 Will it be any easier to diagnose RA? 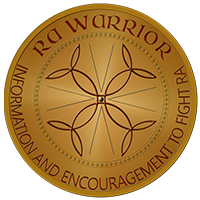 Will RA patients be diagnosed and treated any earlier? The new model is a point system similar to that used for diagnosis of other diseases such as Psoriatic Arthritis. Here is an example on MedicalCriteria.com near the bottom of the page. Points are accrued in each of 4 categories. In this case, a score of 6 constitutes a diagnosis of Rheumatoid Arthritis. Blackjack: how can you get a score of 6? If you like to play card games, you are probably already thinking: what is the easiest road to 6? When would you have hit six? Was it early in the progression of your RA? I am “lucky” here. I would have scored a 9 during the first few months of my full-blown Rheumatoid Arthritis. And, since it’s not actually Blackjack, a 9 would have scored some disease modifying medicine. On the other hand, during the 25 years that my symptoms were Palindromic, I would have scored only a 4 with about 15 joints involved. The Journal of Rheumatology reports that 35-45% of all Rheumatoid Arthritis patients will have “normal” blood test results throughout the course of their disease. That includes ESR, CRP, and Rf. All of the three will remain negative for as many as 28% of people with RA. Adding the anti-CCP test (ACPA on this chart) to the criteria is something which I have demanded for months. It is as important and valid as the Rheumatoid factor (Rf). So, it is significant that the ACR is willing to place anti-CCP on equal footing with the Rf. However, with this scoring method, it may not help many in this large group of Rheumatoid Arthritis patients who are seronegative for this reason: patients with a negative Rf are more likely to also have a negative anti-CCP. Two things are absent from the new criteria. Gone is the emphasis on hands and wrists. It is replaced with an emphasis on “small joints,” which I surmise elevates our feet. (Pun intended; we need it.) Gone from the list are erosions and rheumatoid nodules, both of which are usually seen as evidence of long term disease. The ACR are hoping to diagnose before those appear. What’s your score today? And what would it have been early in your disease progression? Would you have been diagnosed differently? I was fortunate to be diagnosed and treated immediately, with only hands affected at that time. Blood test confirmed. I’ve been to several different rheumatologists over the years, and they’ve never been hesitant to treat no matter how mild or how severe my symptoms were. More likely, they wanted to OVERtreat. I am a “5” on joint involvement (it’s faster to tell you which joints aren’t affected). I am a “0” on serology, and a “1” on duration of synovitis. Synovitis lasted 9 months with my first flare last year and ended after 2 months on DMARD’s. I score a “0” on Acute Phase Reactants giving me a total score of 6. I am one of the 33-45% who has had normal blood tests throughout. I just had my one year anniversary with RA. I take Sulfasalazine and Plaquenil. Celebrex gave me a GI bleed this past summer so no more “NSAID’s” for me. 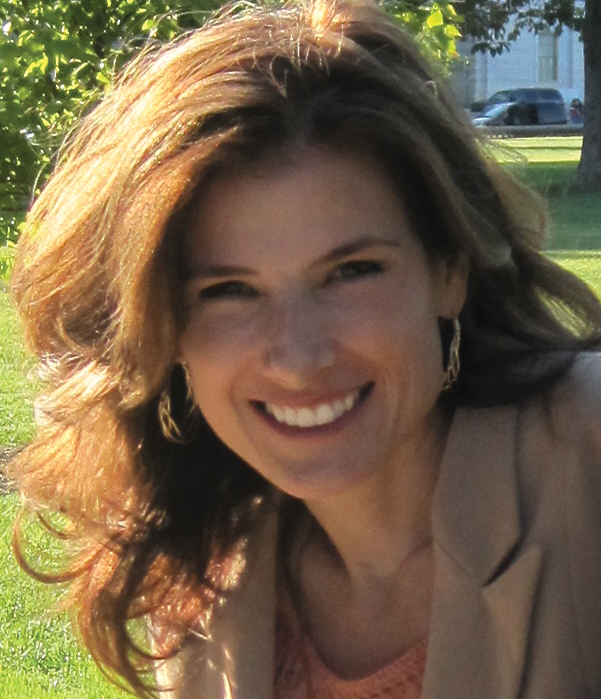 I was lucky and had diagnosis within 4 months of the onset of RA at age 44. I have been reading the interesting posts on remission. If this is remission I am sorely disappointed. While not in the active flare I had I am by no means free of this disease and feel no where near my pre-RA self. I would call it “managed” at this point. My swelling is gone, my pain levels are way down, the stiffness is vastly improved and my energy levels are much better. I have much to be thankful for. I have been holding my breath as winter approaches, wondering when the next flare might come. Keep up the great work. I really appreciate all of your research and reporting. 10 at diagnosis and 4 right now. While better still not where I would like to be. 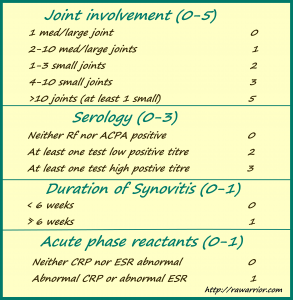 Joints 5 + Serology 0 + Synovitis 1+ CRP/ESR 1 = 7 Pts for 6 Years. RA/ANA low positive in last 6 mos. Just dx’d 3 weeks ago. How many times were you seen, Mary Lynn, before diagnosis? It varies how the standards are used & many still use the 1987 guidelines. Most people have to go to more than one rheum doc to get a diagnosis. Arrrgh – Here is what gets me, who decides if you are swollen? The first three Docs that I pleaded with (only one of which was a Rheumatologist) recognized that there was some swelling but didn’t find it…”diagnostic” and with negative labs there was no diagnosis or treatment. I had a great number of joints involved, so based on my assessment I hit the magic #6. I finally found the right Dr. I didn’t even have to plead. He practically diagnosed me from across the room and immediately started me on MXT. He also informed me about being serum negative and how it could take 2 years for my blood work to catch up with the disease, if ever. Of course, waiting for 2 years to see what happens is not a good policy with RAD. PS – I travel 2 hours to a different city to see Dr. Right. It is worth it. It sure is. Just to be treated instead of wasting time pleading to be believed. “Who decides what’s swollen?” is sure a key question w/ this disease. 96% of those w/ so-called “clinical remission” based on lack of perceotion of what I call “conspicuous swelling” are actually swollen when examined by skillful use of mri or ultrasound. When my symptoms began, I would have only been a 4. My rheumy started treatment immediately tho (sulphasalazine and plaquenil, prednisone and mobic) to get my symptoms under control. In part, the prednisone was a test – to see if I responded. I did, and so he concluded that while my ESR and CRP were normal, inflammation was the cause of my pain, not osteo or something else. So he was treating me long before I met the official diagnosis criteria, in the hope that I would *never* meet the criteria. I think he was very forward thinking. Unfortunately my disease hasn’t turned out to be so mild. But still no where near as bad as many others. I believe if he hadn’t started treatment, I would surely be worse off. I first tested positive for systemic inflammation in Jan 2011. In May 2011, I was diagnosed with an odd spondyloarthropathy and started on Sulfasalazine. No improvement. I don’t like the criteria. I’ve had JRA since 1997…I was 9 years old. I would’ve only been a 4 and because I was,completely seronegative, I was diagnosed via synovectomy. For ten years I was only treated with NSAIDs which I can no longer take. I also have Ehlers-Danlos Syndrome which my docs completely missed. Both rheumatologists were so awful I never wanted to see one again and didn’t until I found my current one. The erosions saved me. I then had a positive ANA which was pretty low. I have several skin and systemic issues and actually also fit Lupus criteria…my RA is quite atypical in that it’s not symmetric etc. I was treated with Prednisone for five years and was pulled off Plaquenil last year. I’ve been on methotrexate since 2011. I complained about my elbow for over two years and the MRI that was finally ordered showed erosion. I’m in the worst flare to date and now have ESR and CRP but have never been tested for CCP. I’m on max of methotrexate and now MUST have a biologic. We,are trying to get Rituxan but my insurance is dragging us through the mud. A lot of this could have been prevented and even now, I’d only be a 6 because all my other symptoms are ignored by the new criteria.